Hecht Optics balances theory and instrumentation to provide you with the necessary, classical background through a lively and clear narrative. 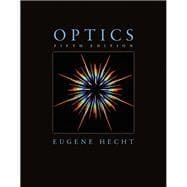 Optics, Fifth Edition is distinguished by three core imperatives for the reader: up-to-date content in line with the ever-evolving technological advances in the Optics field; a modern approach to discourse including studies on photons, phasors, and theory; and improvements and revisions to the previous edition’s pedagogy including over one hundred new worked examples. Gene Hecht is a professor of physics at Adelphi University and author of a number of books including three on American ceramics and seven on physics. His main interests are the history of ideas and the elucidation of the basic concepts of physics. He spends most of his time teaching, studying physics, and training for his fifth degree black belt in Tae Kwan Do.